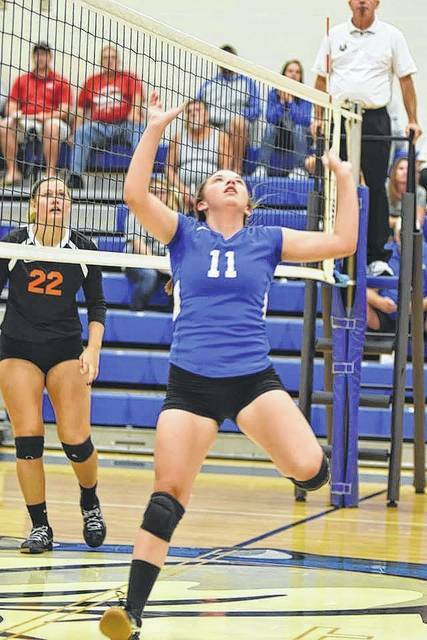 CRESTLINE — On Thursday, the Crestline Lady Bulldogs welcomed the Lucas Lady Cubs to their home gym to do battle in Mid-Buckeye Conference volleyball action. The Lady ‘Dogs, fresh off of their first win of the 2017 season on Tuesday over conference foe Mansfield Christian, were defeated by the visiting Lucas squad in three straight sets; 25-18, 25-22 and 25-16. Crestline is now 1-3 overall and drop to 1-1 in MBC play. Crestline would find themselves trailing in all three sets on the evening but would continuously make a strong push that would come up just short in a match that started ahead of the scheduled 7 pm start time. In the second set, the game would go back and forth with Lucas prevailing in the end. When the Cubs would attempt to pull away from the home team, Crestline would respond with a run of their own. The roles would continuously reverse until unforced errors would give Lucas the edge at the conclusion of the set. Lucas appeared to be poised to run away with the contest in the third set but strong serving by senior and dual-fall sport athlete Michaela Jeffrey would help the Bulldogs stay in the game. After five ties and four lead changes in the set, Lucas used a 12-5 run over the host to secure the set and match victory. On the night, Crestline recorded a total of five aces. Jeffrey lead the way with three while fellow senior Lydia Tadda notched one and Desi Naveja one as well for her only serving point. Jeffrey posted 12 serving points on the night and Tadda, seven. Lauryn Tadda finished with three serving points and Alandra Tesso, two. Tesso would be the primary set-up player for the Lady ‘Dogs on Thursday, recording 17 assists and would also manage one kill. Alex Miller would chip in four assists as well. The top attacker on the night for the home squad was Lauryn Tadda with seven kills. Jeffrey and Lydia Tadda both finished the contest with six kills apiece for Crestline. Rounding out the ‘Dogs attack was Bri Briggs and Kennedy Moore, both contributing two kills. Defensively, the Bulldogs put up 68 digs and just one block against the Lady Cubs’ attack. Briggs provided the only block for the home team while also recording one dig. Lauryn Tadda and Naveja had a big night defensively, racking up 21 and 20 digs, respectively. Other players dig stats for Crestline were: Tesso- 1; Jeffrey- 11 and Lydia Tadda- 14. Three matches await the Crestline Lady Bulldogs next week. They will start the stretch at home on Tuesday, September 5 when they will play host to Canton Central Catholic. On Thursday, the Lady ‘Dogs will once again be on their home floor and welcome to town another MBC foe in the likes of the Loudonville Lady Redbirds. A tourney at Ridgedale is in store for Crestline on Saturday, September 9. Photo courtesy of Shelley West Clark Crestline’s Alandra Tesso prepares to set up a Lady ‘Dogs attack attempt during MBC action on Thursday night. The hosting Bulldogs would drop their league contest against the Lucas Lady Cubs in three sets. https://www.galioninquirer.com/wp-content/uploads/sites/38/2017/09/web1_Alandra-Tesso.jpgPhoto courtesy of Shelley West Clark Crestline’s Alandra Tesso prepares to set up a Lady ‘Dogs attack attempt during MBC action on Thursday night. The hosting Bulldogs would drop their league contest against the Lucas Lady Cubs in three sets.